There’s nothing more admirable than owning a mistake. Conversely, there’s nothing more disappointing than pointing the finger elsewhere. 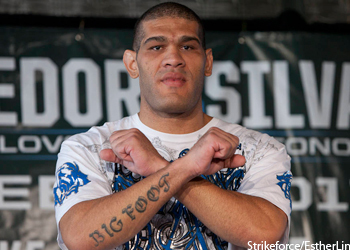 Shortly after it was reported UFC heavyweight Antonio “Bigfoot” Silva (pictured) flunked his post-fight drug test for elevated levels of testosterone following this month’s epic war with Mark Hunt, despite the fact he was issued a therapeutic-use exemption for testosterone replacement therapy, Silva admits a mistake was made, but it wasn’t committed by him. The event took place inside Brisbane Entertainment Centre in Australia, so UFC vice president of regulatory affairs Marc Ratner oversaw the event. This marks the second time in Silva’s nearly-nine-year professional career that he’s failed a drug exam. The first occasion occurred back in 2008 when the anabolic steroid Boldenone was discovered in his system after beating Justin Eilers to capture the EliteXC heavyweight title. Silva has been issued a nine-month suspension and forfeits his $50,000 “Fight of the Night” bonus check, which now goes to Hunt. In addition, despite brawling to a majority draw, UFC president Dana White was so thrilled with their instant classic that he awarded both athletes with their win bonuses. Obviously, Silva can also kiss that payday goodbye.